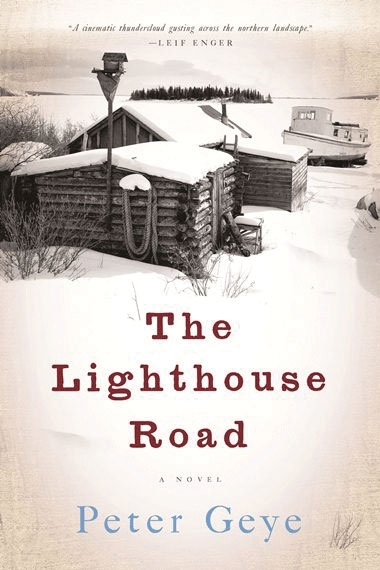 Listen to a podcast of Peter Geye reading an excerpt from The Lighthouse Road in an interview on KMSU Weekly Reader. Hosts are Benjamin Allocco and Amy Fladeboe. Against the wilds of sea and wood, a young immigrant woman settles into life outside Duluth in the 1890s, still shocked at finding herself alone in a new country, abandoned and adrift. In the early 1920s, her son, now grown, falls in love with the one woman he shouldn’t and uses his best skills to build them their own small ark to escape. But their pasts travel with them, threatening to capsize even their fragile hope. In this triumphant new novel, Peter Geye has crafted another deeply moving tale of a misbegotten family shaped by the rough landscape where they live at the mercy of wildlife and weather—and by the rough edges of their own breaking hearts. The Port av Kristiania arrived at her final destination in the middle of the night. Thea was sleeping in her bunk when she felt the ship’s definitive stop. She found her bags and joined the crowd and by the time she reached the main deck she was wide awake and consumed by a new awe: Kristiania—even at night, perhaps especially at night—sprawled all around her. The gas streetlamps flickered near and far, those on the yonder hillside a kind of greasy mirage that might not have been light at all, might have been only an impossible reflection. There were warehouses on the waterfront three times larger than the ship she was now stepping off. Everywhere the sounds of harbor life thrummed: the grinding and shrieking of train and trolley tracks, the clatter of horses’ hooves on the dock’s planks, the moaning of loading cranes, and above and below all of it the sound of human voices. Before then, Thea had never seen more than one hundred people gathered together. But even in the middle of the night there were thousands of people here. In the next slip two steamships, each twice as long as the Port av Kristiania, were loading, crowds of people tunneled into the shadowy quay. As Thea reached the gangplank, she noticed the taut ship lines crisscrossing the docks, the enormous nets hauling cargo onboard the steamships before her, and casks by the thousands ready to be loaded into ships’ holds. As soon as she was on the dock she was swept into a cordoned area where several nurses stood ready to examine and interrogate the passengers. One at a time they were led to tables. When it was Thea’s turn, a grim-faced woman signaled her to come forward. Thea was asked to provide her ticket for passage. The nurse confirmed the ticket against a list in her passenger log and proceeded to ask a series of twenty-nine questions. Aside from the routine questions regarding her final destination and place of birth and the promise of labor in America, she was also asked whether or not she was an anarchist or polygamist, if she was in any way crippled or had deformities, if she had ever been imprisoned. She spent fifteen minutes answering these and other questions, and when the interview was complete, the nurse took Thea into a curtained area and asked her to remove her cloak and hat. The medical examination that followed was cursory. After the nurse listened to Thea’s lungs with her stethoscope and checked her for a hunchback and diseases of the skin, she filled out a landing card and told Thea she could go aboard Thingvalla. As she ascended the steep gangplank, she could already feel the melancholy sea in the soles of her feet. Author photo by Matt and Jenae Batt.